still going strong, awesome little plant that is growing just fine. The Cinnamon Fern is quite a sight to see. It adds almost a lacy look to any garden or landscape and it quite breathtaking. Cinnamon Fern is a hardy and durable plant. During the spring months, this fern’s stems or fronds unfurl and are slightly fuzzy in texture. They can reach lengths anywhere from two to four feet in proper conditions. These fronds are also called croziers, and some even refer to them as fiddleheads. They will are light green, sterile and have a sort of lance shape to them. They are quite interesting to look. After it happens, more fronds will appear from the middle that will be upright, and these will release spores to help propagate. Like all ferns, the Cinnamon Fern will not produce any blooms, flowers or seeds but will release spores instead. These unfurling fronds will remain extended and beautiful until the first frost of the year at which point they will turn brown or yellow and die off. This type of fern will need fertile soil that is full of moisture and humus, and the ideal pH will be anywhere from five to seven. Keep the fern evenly watered; it can withstand as many as six hours of direct sunlight. However, it is recommended that a partially shaded area be used for this plant as a lot of the sun might affect the growth and development of this beautiful fern. Sometimes scorching has been seen on these ferns when left in the sun too long. Many gardening experts recommend planting Cinnamon Fern under trees that will produce much-needed shade during the hotter temperatures of the day. You will also want to space the plants anywhere from twenty-four to thirty-six inches apart to allow for the root system as well as the plant’s growth and development. Additionally, if you have newer growth on the plant, it will tolerate much sunlight but will eventually require more shade than sun. You should also avoid planting this in soil that does not have proper draining. Waterlogged soil will harm the growth and potential of this plant. If you do have moist grounds such as this, try adding peat moss to the soil mixture to help with drainage, as well as even water retention. It will live a long time. One can enjoy the beauty for a long time adds to any yard. If you find that this fern has become too large for its area, you can divide it into the early spring months of the year. Divide at the root clumps of this fern, and you can move the split parts to wherever you want. Just remember to make sure there are shade and plenty of moisture. This is a considerable fern that loves the care Mother Nature gives it. It does not need special anything to grow, become extra large and a beautiful, healthy statement in any garden landscaping theme. It's a lovely addition to a border of a property providing a stunning yet elegant scenery bordering your property when planted underneath shade trees in the wild. It's also great to plant in swamps to keep them clean and helps prevent stagnant water and knits and mosquitoes. Cinnamon Ferns can be found in the United States and also Eastern Asia. Cinnamon Fern will eventually die in the winter but will be back. It is known as a living fossil with evidence of this plant dating back to 75 million years. It is also used to help grow along with orchids. The cinnamon fern loves partial shade and does well with 60% sunlight too. Ferns are hardy species that's been living long before people existed research has found. 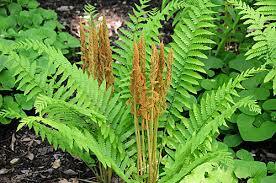 Cinnamon Fern are easy to grow and reestablish when they grow or transplanted. Cinnamon Fern is also used for many horticultural things. Many Native Americans would use this fern to help treat headaches, chills and colds, rheumatism and even snake bites. Some cultures also used this plant as a source of food, eating the fronds off the plant either raw or by cooking them. Some people still even do this today. Most say they are similar in taste to a combination of asparagus and broccoli. The root systems on these ferns are wiry, fibrous and black. Some even use the roots for their porous material to help with other plants such as orchids. This plant is also a protected species in some states so make sure to check on this before you disturb any of these you may see in the wild. Its name comes from the color of its fronds. They are the color of cinnamon, and they add a visually striking appearance because of the green fronds that are also on the plant. It is a great color combination and will stand out in your garden area. It is unlike other ferns, and it will be able to endure flooding. So it will be okay to plant this in flood-prone areas, and the fern will still thrive. This fern also acts as a food source for many woodland creatures, especially white-tailed deer. They just cannot resist the tasty treat this fern produces. As stated earlier, the fern will use spores to propagate, but will also use the rhizomes in its root system as well. The rhizomes help the plant to spread and reach new areas or the garden or woodland area it is. In addition to being visually striking and its many horticultural uses, this fern also proves to be valuable to many ecosystems. It helps to act as a shelter for many small animals such as birds and squirrels as well as providing food for many small animals in the area. A few plants that have been paired with this particular fern include wild strawberry bushes, Greenbrier, and even maple trees. It will grow beside these without interfering with their growth and development and will not steal all of the nutrients and water from these plants. You can also plant this alongside some brightly colored perennial flowers to add even more life to your garden. It brings, even more, attention to your landscape. 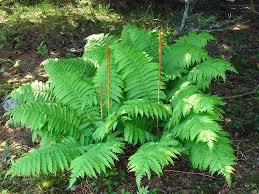 Make this Cinnamon Fern a consideration when you want to add to a partially shaded area of your garden. The uses and beauty it will provide will give you years of enjoyment.